As things are slowly but progressively improving in terms of food information to empower consumers, there is still much work to be done by many, including you. I am not going to argue the ‘the food you eat shouldn’t even have labels’ because the reality is, the majority do consume foods with labels, not right-from-the-farm-foods. The importance of labels cannot be overstated. It would be great though if even the labels had correct information on them. Story on the latter coming….NOW! Sometimes, labels can be empowering. I spent some time going shopping with my client a few weeks back to get her some fancy new workout digs. Since we were also in the vicinity of a place she frequently eats poorly at, I wanted to scope it out. The store is actually pretty good but does have a ton of high-calorie poor nutrient dense foods too. Of course, much of this is also marketed as health foods, which it is not (more on that later). After giving me a walkthrough of the store, she mentioned that she wanted to grab something quick, easy and health promoting for when she got home. It was late, she didn’t want to cook and the advised meal-prep was not in sight. We went over to where she sometimes buys a healthy salad when she isn’t hitting up this joint for her pastries (insert my smarten up face here). *Sidenote: I do not perpetuate the idea of forbidden foods but this is a problem for her and many in terms of frequency and reliance that cannot be enabled. When she showed me the salad she would buy, my initial reaction was good. It was colourful, had lean protein and sources of healthy fats. As with most things, superficiality can be a deceptive mutha. There is not a lot of agreement or consensus with anyone really in terms of what to eat but calories matter and quality matters for a myriad of reasons beyond this post. For those reasons, with her, I wanted to analyze the label. The calories listed were 180, the fat was 11g, the protein was 25g and carbohydrate was 20g. Why did I specifically remember the fat content? Well, because right off the bat I knew that by reading 11g of fat, the calories were all wrong. The thing is, aside from the numbers being off, the serving size was per 160g and the package was 320g. There are many reasons why this error may have happened and my only point here is that you need to educate yourself on some of the basics too. On that second note, here is a picture I took of a label to again, show you why looking at the labels is important. The actual package was 380g. If you look closely, you will see that one serving size is 130g. The package was not setup in a way that you would even think that the nutrition information on the label was not for the entire package. When you go to a store and buy one of those ready-made salads, do you expect to eat only a part of it or do you typically eat the whole thing? Other smaller packaged items you would typically think is one serving too, but often it is not. 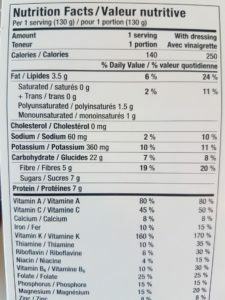 While there are things to look for on food labels, sugar content, fiber, THE INGREDIENTS, protein, fat type, you must also be sure to pay attention to the listed details. It isn’t about become obsessive or elitist, although some would fare better off I am sure, but it is about empowering yourself with tools to help you reach your goals and most importantly, to be a healthier version of you in mind and body.